Hundreds of thousands of visitors flock to this baroque palace in Munich every year. Nymphenburg Palace (Schloss Nymphenburg) is one of the city's top sights and one of the largest royal palaces in Europe. "Castle of the Nymph" is a showpiece of German history and a not-to-miss attraction in Bavaria. Nymphenburg Palace was built as a summer residence for the Wittelsbach in 1664. Its ornate design reflects its origins as a love letter from prince-electoral Ferdinand Maria to Henriette Adelaide of Savoy after the birth of their long-awaited heir, Maximilian II Emanuel. Local materials like limestone from Kelheim were used, but the original design was straight from the mind of Italian architect Agostino Barelli. Over time, the palace expanded with additional pavilions, connecting gallery wings and stylistic changes as different trends came into vogue. Beloved son Maximilian II Emanuel was responsible for many of the changes, but other people also put their stamp on the palace. In 1716 Joseph Effner completely overhauled the facade in French Baroque style with pilasters. Court stables were added in 1719, an Orangerie was built in the north in 1758 and the Schlossrondell was built by Max Emanuel's son, Holy Roman Emperor Charles VII Albert. In 1792, Elector Charles Theodor opened the grounds to the public and for the first time, common folk could admire the magnificent landscape. That tradition continues today. Rooms show their original baroque decor, with others offering an updated rococo or neoclassical design. Visiting the palace is also a chance to mingle with modern royalty. Nymphenburg Palace is still the home and chancery for the head of the house of Wittelsbach, currently Franz, Duke of Bavaria. Jacobites trace the line of British monarchy from King James II of England to Franz, his great-great-great-great-great-great-great-grandson. This gives him a possible claim to the British throne, though the octogenarian is not pursuing this angle. 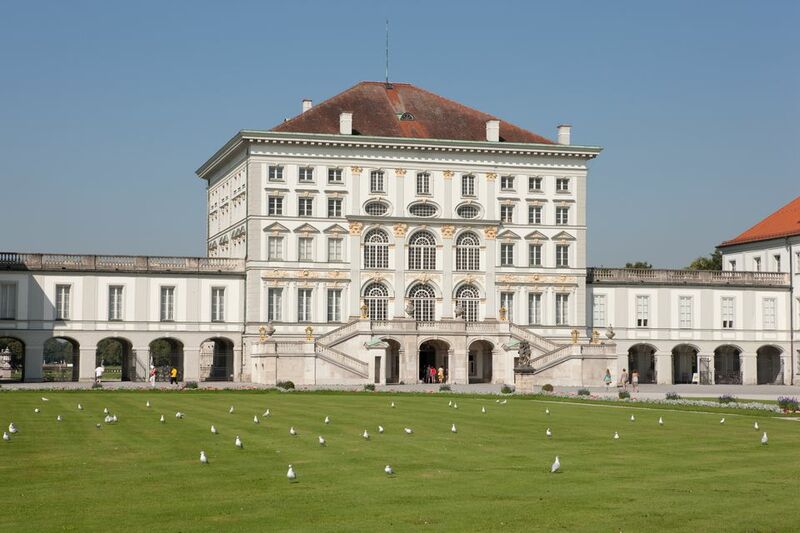 The Schlossmuseum offers access to the interior of the palace including the royal apartments, central pavilion, north and south galleries, inner southern pavilion and garden pavilions. There are no shortages of magnificent and historically significant sights at Nymphenburg Palace, but you can't miss these top attractions. The Steinerner Saal (Stone Hall) is the three-story grand hall. It features impressive ceiling frescoes by Johann Baptist Zimmermann and F. Zimmermann with Helios in his chariot taking center stage. A small dining room in the Inner Southern Pavilion holds King Ludwig I's Schönheitengalerie (Gallery of Beauties). Court painter Joseph Karl Stieler was tasked with creating 36 portraits of the most beautiful women in Munich. One of the most famous is Lola Montez, King Ludwig's infamous mistress. Queen Caroline’s bedroom features original decor like mahogany furniture from 1815, but the real attraction is that this is the room where King Ludwig II was born on August 25th, 1845. The child was named Ludwig to honor his grandfather Ludwig I who was born the same day. Look for busts of Crown Prince Ludwig and his brother Otto on the writing desk. The tour ends at Outer Northern Pavilion which houses the palace chapel. Here visitors find more fantastic ceiling paintings.covering the life of St. Mary Magdalene. Marstallmuseum (Carriage Museum) - In the former royal stables in the South Wing, the Carriage Museum holds one of the greatest coach collections in Europe. It includes the French Rococo Coronation Coach used for Emperor Charles VII in 1742 along with carriages and sleighs of King Ludwig II. Porzellanmuseum München - Nymphenburg Porcelain Museum's Bäuml Collection displays pieces from the 18th to the 20th centuries. Founded in 1747, the museum is located above the stable. Museum Mensch und Natur (Museum of Man and Nature) - This natural history museum is in the north wing. Erwin von Kreibig-Museum - A permanent exhibit of this local sculptor's work is located at the South Schlossrondell. The 490-acre park surrounding the palace is a highlight of Nymphenburg Palace. It has undergone a metamorphosis from the Italian garden it began as in 1671 to Dominique Girard's French incantation to the English style you see today. This English design is from Friedrich Ludwig von Sckell who also created the English Garden in Munich. Certain elements of the Baroque garden were retained like the Grand Parterre, but much of the garden has been simplified. That doesn't mean it is any less breath-taking. Water plays an integral role in the park with cascading waterfalls and shooting geysers. The cast iron pumps that keep the water flowing are a marvel. They have been operating for over 200 years and it is the oldest continuously working machine in Europe. The water theme continues with two lakes on either side of the canal. Visitors can enjoy its peaceful ambiance in the summer by taking a gondola ride (every day from 10 for 30 minutes; cost 15 euros per person). The park is a haven for the people of Munich, as well as wildlife. Deer, rabbits, foxes, frogs, swans and dragonflies are plentiful and add to the beauty of Nymphenburg Palace. This ticket provides entrance to the palace, Marstallmuseum, Porzellanmuseum München and park palaces (park palaces are closed in winter). Visitors can purchase discounted entry to individual attractions. Audio guide available in German, English, Italian, French, Spanish, Russian, Chinese (Mandarin) and Japanese (Fee: 3.50 euros). Schloss Nymphenburg is easy to access from central Munich as it is linked by public transport and connected to major motorways. Public Transport: S-Bahn to "Laim", then take a bus to "Schloss Nymphenburg"; U-Bahn to "Rotkreuzplatz", take a tram to "Schloss Nymphenburg"